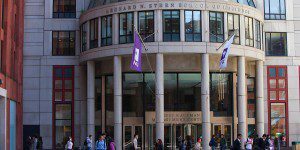 New York University’s Stern School of Business hosted the invitation-only Economic Outlook Forum last week, which featured an array of established financial experts from prominent business institutions. The forum was titled, “The Economic and Market Outlook.” NYU Stern Director of the Center for Global Economy and Business Kim Schoenholtz moderated the discussion, which featured three panelists, including: Citigroup’s Willem Buiter, Deutsche Bank’s Peter Hooper, and Berenberg’s Mickey Levy. Buiter is the Global Chief Economist at Citigroup, where he has worked since 2010. Formerly in London and now based in New York City, Buiter also teaches at the School of International and Public Affairs at Columbia University. Hooper is the Managing Director and Chief Economist for Deutsche Bank Securities, where he has worked since 1999. Before that, Hooper spent 26 years with the Federal Reserve Board in Washington DC. Levy has spent over 30 years researching economic and public policy. Prior to Berenberg, Levy worked at Bank of America. Similar to Hooper, Levy has ties with Federal Reserve Banks. Schoenholtz, who has worked at NYU Stern since 2009 after a stint with Citigroup, proved to be the perfect moderator. He’s an expert on money, banking, and macroeconomics with an immense global experience, having worked in New York City, London, and Tokyo. His influence continues as he sits on the Financial Research Committee of the U.S. Treasury’s Office of Financial Research, as well as U.S. Monetary Policy Forum. Different universities have hosted their own Economic Outlook Forums, including the University of Chicago Booth School of Business and Towson University.